Pinnacle’s Ultra Poly Clay is the single finest detailing clay available today. Two times the slickness and shine on paintwork, glass, metal and fiberglass! Get TWO 4 oz. bars (that’s 8 oz. total!) of Pinnacle Ultra Poly Clay to experience the glassy look and feel twice as often or on twice as many vehicles! EIGHT full ounces of the amazing Pinnacle Ultra Poly Clay are available at a special value in the Pinnacle Ultra Poly Clay PLUS Special! This premium, fine grade clay creates a silky smooth, truly clean shine on well-maintained finishes. Now you can enjoy twice the slickness and twice the shine with two 4 oz. bars of this unique clay, available only from Pinnacle Natural Brilliance. This new ultra fine grade of clay removes paint contamination and is recommended for frequent use. Use Ultra Poly Clay as often as needed to maintain a slick, smooth finish. This is an ultra safe, nonabrasive grade of clay that works on all types of paint, glass, and chrome. Use Pinnacle Clay Lubricant to provide excellent lubrication and surface protection as you clay. 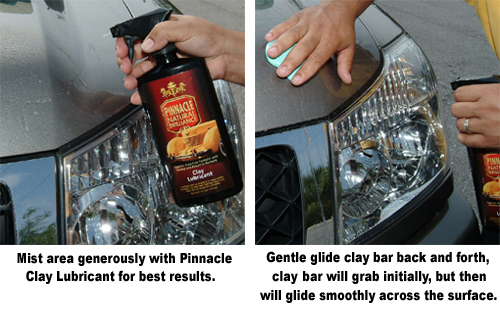 Pinnacle Clay Lubricant creates a slick barrier between the paint and the clay cleaning material. The high lubricity formula prevents loosened contamination from scratching delicate clear coat finishes yet it will not break down or degrade the integrity of the clay. 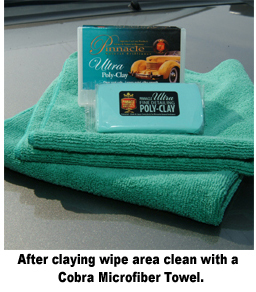 The lubricant can also be used to remove any clay residue from the vehicle with the help of a microfiber towel. Imagine being able to clay your vehicle monthly without any fear of abrading the finish or dulling the shine. It is possible with Pinnacle Ultra Poly Clay! Enjoy the mirror-like finish twice as often with the Pinnacle Ultra Poly Clay PLUS Special! Wash your vehicle before claying. You do not have to dry it. Mist a small section, approximately 2 square feet, with Pinnacle Clay Lubricant. Rub a Pinnacle Ultra Poly Clay bar back and forth across the wet area using very little pressure. It will grab initially; this is the clay grabbing contaminants that protrude above the paint surface. Continue to rub until the bar glides freely. Once the clay glides smoothly across the paint, it’s clean. Use a microfiber towel to wipe off any remaining lubricant and clay residue. Keep any eye on the condition of the clay bar. If it appears soiled, reshape the clay to reveal a clean portion before using it on the next section. If you drop the clay bar on the ground, discard it. To store the clay, mist it with Pinnacle Clay Lubricant and wrap it in a plastic bag. Store it in the original plastic storage case. A total retail value of $71.95, you save $21.96! Poorboy’s World Iron Remover 16 oz. Pinnacle Ultra Poly Clay SpecialPinnacle Ultra Poly Clay – Buy it by the Pound! Expensive, but you get what you pay for when comparing this to other products. This clay bar kit awesome and a must have to keep your ride in great shape. easy to use. makes paint look new again. removes all rough imperfections. makes surface nice and smmoth. Easy to apply, just be sure to use the lubricant that is necessary.